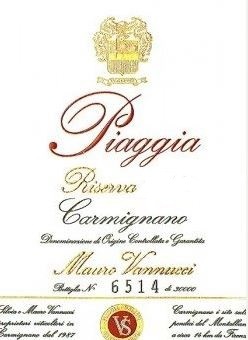 The Carmignano Riserva is the flag ship wine of Piaggia, showcasing a modern interpretation of Carmignano’s Sangiovese base blended with Cabernet Sauvignon, Cabernet Franc and Merlot. The grapes are planted in an old vineyard near Pogetto, over clay and galestro soils on a south-west facing exposure. The grapes are all hand-picked and go through punch down and pump-overs during fermentation. Aging occurs in French oak for 18 months and racked before bottling, with no fining or filtration.